God’s timing is always perfect. He called Mary Ruth Sandlin of Hokes Bluff, AL, to her heavenly home on Labor Day, September 3, 2018, as her 89 years of work on earth of faithfully serving had been done. Pastor Eddie Gooch will lead the celebration of her life at Glencoe-Hokes Bluff Funeral Chapel on Thursday at 11am with a time of visitation from 9-11. 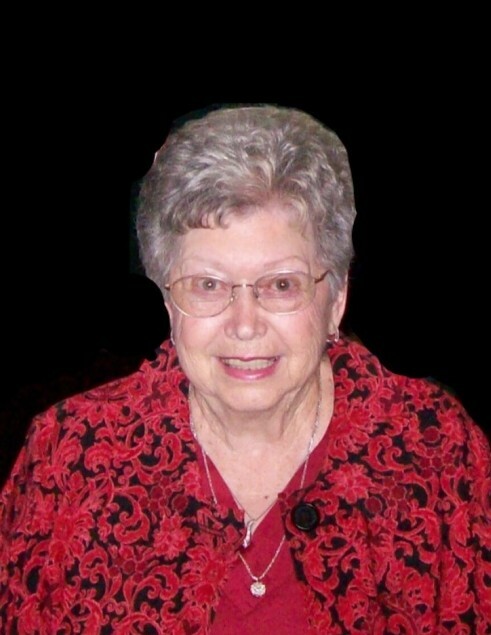 Because she had accepted Jesus as her Savior, we rejoice in knowing she is celebrating with her husband of 70 years, G.R. “Buddy” Sandlin, who had been waiting on her for almost 3 months, and their daughter, Wanda, whom they longed to see again for 66 years. Mary Ruth left this earth after her parents, Leo and Frances Coffelt, and each of her siblings: Floyd, Morris, James “Bud,” Josephine, and Velma Coffelt. “Maw-Maw” was known for her smile, hugs, and sweet, welcoming spirit to everyone she met. She will always be remembered for the delicious southern home cooked meals, cakes, and candy she made to treat her family, friends, neighbors, as well as her son’s coworkers at Goodyear and local delivery drivers. She was a hard worker and labored alongside her husband on their farm, in chicken houses, gardens, packaging the meat they processed, and even in Goodyear. We cherish the beautiful ceramics and quilts that Maw-Maw meticulously made with perfect steady hands and a loving heart. Thankfully, after years of incomparable hard work, Buddy and Mary Ruth were able to enjoy traveling, seeing God’s masterpieces in each state, in addition to Germany, Canada and Mexico. They made lasting friendships with their camping friends along the way, and even when they were no longer able to travel, the memories they’d share still brought happiness. She will be missed dearly by anyone blessed to have known her, especially her children: Kathy (Joe) Kirkland, Columbia, SC; Larry (Donna) Sandlin, Hokes Bluff, AL; grandchildren: Tracey Johnson and Steven (Lisa) Baker, SC; Erin (Taylor) Morgan and Jessica (Daylon) Staton, Hokes Bluff, AL; great-grandchildren: Breighlyn, Dylan, Layden, Landon, Dean, Mazely, Joshua, Julia, Andrew, Dalton, and Evan; and chosen family, Martha Reeves. Pallbearers are Dylan Lancaster, Dean Morgan, Taylor Morgan, Daylon Staton, Danny Coffelt, Dennis Coffelt, and Jimmy Coffelt. Honorary pallbearers are Steven Baker, Charles Mann and Joe Kirkland. The family has been blessed with overwhelming support and love, and is forever grateful for Martha Reeves, who enabled Buddy and Mary Ruth to live as independently as possible in their own home. A special thanks to Comfort Care Hospice (granddaughter, Erin) for enhancing the quality of the journey with compassionate care over the past year and stepping in as extended family (La’Tisha, Mackenzie, Emily, Michelle, Hannah, Alex, Faynita, Bro. Rodney, Dr. James Yates, and Sammye Bradley, NP), and also to Dr. Oluwole Akisanya and First Care Medical Staff. The family extends great appreciation to Hannah Davis, CNA, of Comfort Care for her year of love and dedication to Buddy and Mary Ruth and even scheduling her days around their needs and wishes. Hannah was truly a blessing from God and will never be forgotten. Thank you all for the wonderful visits, phone calls, messages, and food provided. In lieu of flowers, memorials may be made to Hokes Bluff 1st United Methodist Church. Proverbs 31:28 “Her children arise and call her blessed…” her family and friends are the ones who were most blessed to have her.